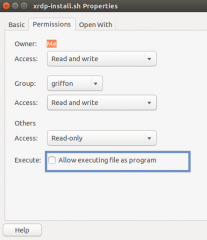 Today, this post will tackle again the custom installation of xRDP on Ubuntu 16.04.2 and have access to the Unity Desktop Interface. A previous post has been published earlier this year (see here). Based on the feedback and comments received from the community, we feel that an update is necessary to this previous post. Indeed, some readers have provided great feedback and detected small issues with the custom installation process and we really want to thank all of you for that. Based on your feedback, we can provide better information and drive us to publish again posts and articles on this blog. The previous post about the custom installation has been updated and should be working fine. However, to make sure that everybody is aware of the changes and updates, we are publishing this post which should be considered the latest valid instructions guide to install xRDP on Ubuntu 16.04.2. As you probably know, Ubuntu 16.04 is the latest LTS release that would ship with the Unity Desktop Interface. The change from Unity to Gnome will have an important impact and we are expecting that a lot of people would stick to Unity in the coming years before switching to the Gnome Desktop interface in order to train and educate users to the new desktop environment. This is why we are still providing information about xRDP and Unity Desktop…. The version 1.9 script has not changed dramatically. However, it does take into account the changes that have been introduced in the latest release of xRDP (which is 0.9.2). The changes are quite small but in order to provide the best experience we feel that this update is needed. Version 1.9 does not introduces major changes. This version of the script check that xrdp is compiled first and then you can compile the xorgxrdp. Some of the lines have been removed because the xRDP 0.9.2 is providing already the correct configuration to the Ubuntu systems. 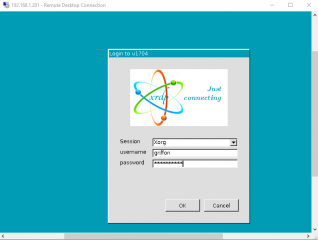 The script will also populate automatically the .xsession file for a single user which is needed in order to access the Unity Desktop Indicator panel. The script will also create the polkit file in order to avoid prompt when connecting through remote desktop protocols. This script would also make available the Drives Redirection and Clipboard features. We have updated the script to version 1.9 to make it clear that this is the latest currently available version that works…. The user that has executedthe script will be able to remote desktop into Ubuntu and the Unity Desktop will be launched automatically. In Ubuntu 16.04.2, you can have the same user logged into the console and to the remote session and this scenario would work. In later version of Ubuntu, it seems that the behavior has changed…(we will investigate a little bit further). The user will be able to reconnect to an existing session as well and the user will be able to use the clipboard and drives redirection features..
As in the past, the issues detected are related to performance and the logout functionality. The performance are acceptable but they are not great. We are working mainly over LAN infrastructure and we can perform our work.. In this post, we have spend some time in updating the previous post and checked the script provided is working and functional. We have slight modified the install-xrdp.sh script in order to take into account feedback and comments from our readers. We think that this update was necessary in order to show that we really take into account the comments provided to us and in order to provide an improved solution. I had to replace the package, else install would complain about missing header file fontutil.h – which strangely according to apt-file search libxfont-dev should provide but according to comments from https://github.com/neutrinolabs/xorgxrdp/issues/100 it seems to belong in libxfont1-dev. FYI ubuntu has a bug that prevents building XORXRDP. Canonical’s devs have fixed it but the fix so far requires people to enable the “proposed” repository. This bug afects ubuntu 16.04 upto 17.10 I believe. If you don’t notce the failure during “make” you will just encounter a blank screen during an attempt at a session. Thank you for the info. We have been notified of the problem and we are currently working on publishing needed information to overcome this situation..
Is there a working solution? Just add “deb http://archive.ubuntu.com/ubuntu/ xenial-proposed restricted main multiverse universe” to /etc/apt/sources.list before installing and everything will work OK. This fixed me getting a blank screen after RDP login. yes, you can either manually copy the fontutil.h file into the correct location and proceed with compilation or you can add proposed repository from Ubuntu..
How can I remove all of the stuff the script installed? I run it once and i can a black screen. and ru-running the script don’t help. then remove all the files used by xrdp; locate and delete the following files or directories…. Normally all these issues should be fixed with the latest updates but you might still want to check this…. Thank you very much！ This post does help me a lot! But if the script is used in Chinese language environment , the ‘/Downloads’ in the script should be changed to ‘/下载’ . After that , it works perfectly. In first I would like to thank you for sharing your enthusiastic work and time to not give up and just use Windows 10 where remote gui is just enabling few ticks and dropping user in remote desktop permissions. 1)	Started here http://c-nergy.be/blog/?p=8952 from google search results. Everything went fine, good performance, easy install, Mate desktop is cool with little footprint on resources. But there are downsides for this tutorial, old xrdp version year 2014 ?! why Ubuntu is packing nowadays this old repository in fresh install I don’t have an answer. Not working from Android phones with remote desktop apps, ending with error. And also not forwarded local windows disks and no clipboard. 2)	Then started here http://c-nergy.be/blog/?p=10752 and 8952 must archive, this should be starting point because it installs latest xrdp from github. But yeah, as 7 years ago, command lines, making from sources, adding missing libraries and other geek tricks. 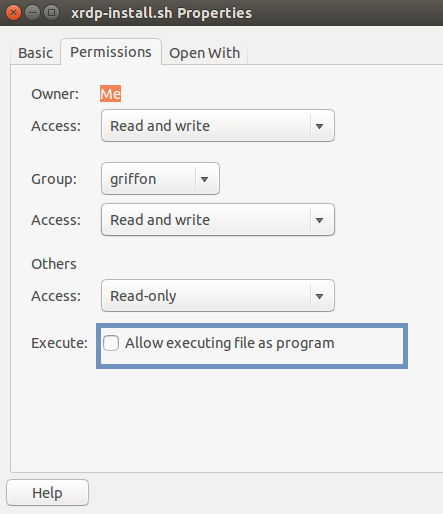 Why that isn’t already included in Ubuntu I don’t have answer, at least in Ubuntu software portal. I didn’t started whole script, I just installed from ssh connection one component by another and adding missing libraries by end of results. Yes, you must open port 22(later you can close) if you are not standing locally behind Ubuntu box and install openssh before starting to play with installs, to not lose control of Ubuntu box After all efforts you must allow users anybode http://c-nergy.be/blog/?p=11043 because this infamous green screen after login. And then install one more missing component http://c-nergy.be/blog/?p=11061 because still green screen. 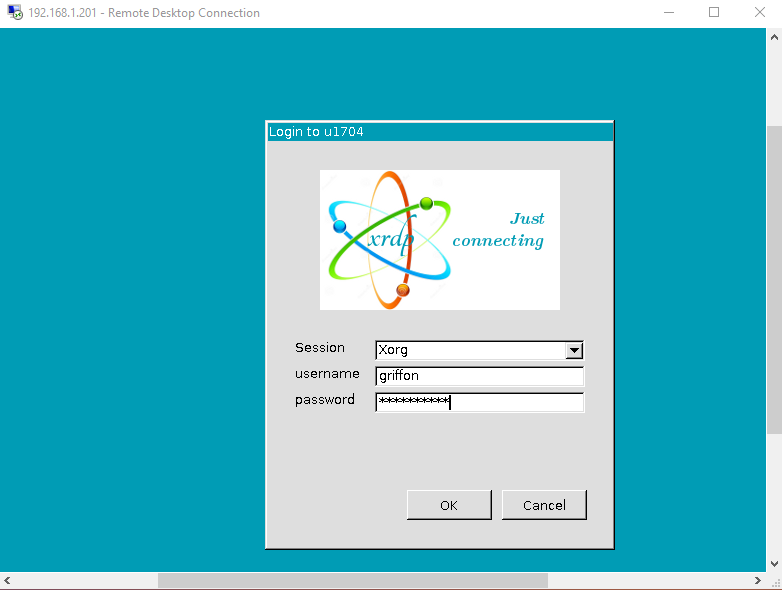 And in the end I am finally with good remote desktop gui. And yes, still problems, I have second ssd disk what I cannt mount from gui but was ok from command line. Error was – Not authorized to perform operation(polkit authority not available and caller is not uid 0) And also not the best performance, eating up 50% of CPU when working with graphical windows, Mate desktop was better, most probably because there are animations in Unity. Would like to use Mate desktop. Clipboard is working that’s cool, and windows local drives are also forwarded. Thank you for sharing you experience with xRDP and providing feedback on the information posted on this blog… As you have noticed, each version of xRDP (and Ubuntu) is improving and provide better results…..
thank you for visiting our blog and we hope you will find more useful information for you…..
Any hints what to check? Can’t see that there are any other Xserver active at all though so I’m not sure that message is entirely correct.